BY JAMES DAVIE BUTLER. LL. D.
In 1844, the journal of a Dominican missionary “among various tribes of savages and among catholics and protestants in the United States,” was published in Milan. Being printed in Italian and never translated into English, this work of 364 pages has never been much known in America. It deserves, however, careful study. During the decade between the years 1830 and 1840, no intelligent man traversed the Wisconsin region more frequently and more thoroughly than this Italian priest, and no one has better described the phases of nature and life there. For material for the following sketch of the life of Rev. Samuele Carlo Mazzuchelli, the editor is indebted to the Sister Secretary of Saint Clara Academy, Sinsinawa, Wis. He was born in Milan, November 4, 1807, of an old and wealthy family, whose name can be traced back to the earliest annals of the city. His middle name is that of the patron saint of Milan, St. Charles Borromeo, whose feast day is November fourth. Carefully educated at home by tutors, and early developing talent, his family designed him for a political career, and were disappointed at his decision to enter the Dominican order of priesthood. Finally gaining their consent, he at the age of 17 entered the Dominican monastery at Faenza and later made his profession at the house of his order in Rome. When Mazzuchelli was 21 years of age (1828) he chanced to hear an address to the students in this house by Rev. Edward Fenwick (also a Dominican), bishop of Cincinnati. This was in the nature of an appeal for workers in the American field, and Mazzuchelli resolved to devote his life to the Indians in Bishop Fenwick’s diocese (then embracing Ohio and what are now Michigan Wisconsin and Iowa). He was too young for ordination, but nevertheless set out at once,–leaving Milan, as Dr. Butler says, in June, 1828. At Cincinnati the bishop employed him as catechist, while he was completing his former studies and learning English, and finally ordained him in the Cincinnati cathedral, September 5, 1830. Towards the close of the month, the young priest was dispatched to the Island of Mackinac, then the center of the great fur trade of the Northwest, and a community much in need of spiritualizing influences. The country west of Lake Michigan was included in his field of work, and Dr. Butler has told us of his wanderings therein. 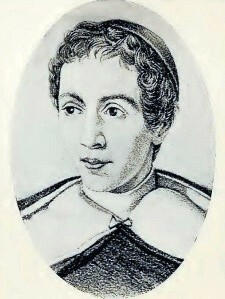 Mazzuchelli was especially interested in education; he always erected a school house in connection with each of the twenty-five or more churches erected by him–as our informant writes: “Mass could be said in the school house until the church was raised, but the children were always first with him. He was an architect of no mean capacity; the plans for his churches and schools were his own; and “very many of the courthouses in Wisconsin and Iowa were built according to plans furnished by him.” By appointment from Rome, he was commissary general of his order in this region; he was also the first vicar general of the diocese of Dubuque, under Bishop Loras. In 1843, the Father returned to Italy to raise funds for buying Sinsinawa Mound, then the property of Gen. George W. Jones, on which he desired to erect an institution of learning. It was while upon this mission that he wrote the book which Dr Butler has synopsized; it was a popular work intended only for Italian readers of the middle and lower classes, who desired information regarding the far-away land from which he had come. About 1844 he built a college on Sinsinawa Mound (a part of the present academy) and was its first president; but later, anxious to resume his missionary labors, transferred the management of the institution to the faculty of the Dominican Fathers in Kentucky. Saint Clara Academy, which he founded at Sinsinawa Mound, but had transferred to Benton, returned to the Mound in 1804, the sisters purchasing the old buildings of Sinsinawa Mound College. The head of the institution is Mother Emily Power, one of those whose early education was received from the founder; his spirit lives in her works. Mazzuchelli was ever forgetful of self. It is characteristic of him that he left no portrait of himself, in manhood. The only original existing is that painted in Rome, by order of his family, when he was a youth at the college of his order. It was copied for Saint Clara Academy some years ago, and we present herewith a photographic facsimile of that copy. Ed. The author was Father Samuel Mazzuchelli. He always writes of himself in the third person, calling himself “the Missionary,” and gives no clue to his name save by mentioning one occasion when he was called on to serve as chaplain of the legislature of Wisconsin, thus enabling us to find it in the journal of that body. 1 Memorie Istoriche ed Edificanti d’un Missionario Apostolico deWordine Dei Predicatori fra varie Tribu di Selvaggi efra i Cat tolici e Protestanti negli Stati-Uniti d’America. [By Samuel Mazzuchelli.] Milano, 1844, pp. 364, O. A copy may be seen in the library of this Society. Ed. 2 An English translation by one of the sisters of the house is now (1898) being given in monthly installments in The Young Eagle, a periodical published by the students of Saint Clara Academy. Ed. The only church he found already built was at Mackinac. This he enlarged, and was the real founder of others in more than a score of growing towns. Nor was he neglectful of schools. Nor did he halt anywhere without administering the ordinances of his church. To detail his experiences during what he calls his apostolate–the hardships, perils, and vicissitudes of pioneer life,– however interesting, would be beyond the scope of the present writing which must be confined to a meagre outline of his travels. The Dominican Mazzuchelli, born in Milan in 1807, left that city for America in June, 1828. A forty days’ passage in an American sailing ship brought him to New York, and without much delay, he went West by the way of Baltimore, to Cincinnati. In that quarter he remained for two years, learning English, and preparing for whatever service the bishop should select him. In 1830 he was stationed at the outpost of Mackinac–there being then only five priests in Michigan, and not one of those in its northern half. His journey was by way of Lake Erie and Detroit, and he reached his post in October He soon pushed on 200 miles further to Green Bay, where he found no church, but as there was a small one at Mackinac he considered that island the best base for his mission, and accordingly reached that point again on November 16. The population there was about 500 largely half-breeds, their language French, and few of them able to read. May 1, 1831 he embarked on a trader’s boat for Green Bay, which was his headquarters for the next half-year, with tours among the tribes around that water. He saw there in October a church of wood (80 x 38 ft.) finished up to the roof as a result of his labors, which were re-inforced by Bishop Fenwick of Cincinnati who had come north for a summer outing. In this season the missionary also started a school among the Menomonee Indians. See documents relating to these enterprises post. Ed. In August of this year, 1831, Mazzuchelli voyaged in a bark canoe from Mackinac ninety miles to the Sault Ste. Marie, which he calls Santa Maria, and preached there both under an oak and in the United States fort. In midwinter he crossed on the ice to Point St. Ignace, and made a snow-shoe tramp to l’Arbre Croche. In the spring of 1832, he returned by the earliest boat of the season to Green Bay, for consolidating his work there. In July he was again at Mackinac Island for consultation with his bishop, who had fled thither from southern heat. About the middle of September, Mazzuchelli left Green Bay for Prairie du Chien where he arrived on the 22nd. This journey was on horseback, and in company with “the judge of the territory,” no doubt James Duane Doty, who was that judge from 1823 to 1832. During this pilgrimage, the travelers may have visited the site of Madison, which appears on Mazzuchelli’s map as Quatro Laghi. One of Doty’s favorite camping places was on the east shore of Third Lake [Lake Monona]. At Prairie du Chien, the priest said mass in an abandoned log house, but found the people too lukewarm to authorize any attempt at building a church. He therefore, after a sojourn of fifteen days, set his face again towards Mackinac, which by his route was a distance of 400 miles. He did not reach that goal until November, after a stormful passage from Green Bay. Soon finding ten Indians in a bark canoe bound for new l’Arbre Croche, he took passage with them and arrived on the evening of the second day. On landing, he saw men throwing one barrel into the lake and breaking another into pieces, and learned that a trader had brought them full of whiskey–and that they were destroyed by order of the local Ottawa chief. The Father suffered greatly with cold, hunger, and exposure before regaining his winter quarters. April 16, 1833, the missionary left Mackinac for his first visit to the Winnebago village, some eight miles from the fort of that name–now the city of Portage, Wisconsin. From Green Bay his journey had been on horseback. He was unable to make himself understood, until he fell in with Pietro Paquette. This interpreter was very helpful in preaching and confessions. Two hundred converts were made, and an Ottawa catechism, by Father Baraga, was translated into Winnebago. In order to get this primer printed, Mazzuchelli journeyed 700 miles to Detroitm It appeared there in 1833, as a pamphlet of eighteen small octavo pages, entitled Ocangra Aramee Wawakakara. Embarking on his return from Detroit on the 1st of November, winds were so contrary that he did not land in Green Bay until the 22nd. Two nuns came thither with him for opening an Indian school. Closing the year with imposing ceremonies at the Green Bay church, Mazzuchelli then itinerated among fishermen upon the ice, even up to Lake Winnebago, and spent the early spring of 1834 among the maple-sugar makers there. He labored much among Menomonees, and claimed, though without success, the annuity of $2,000 appropriated by the United States for their instruction. In February, 1835, the missionary made a second visit to Prairie du Chien. His route thither from Fort Winnebago, was with a trader in a sleigh, and on the frozen Wisconsin River. They scared two wolves from an antelope just killed, and so enjoyed the game themselves. Success at the prairie being small, the missionary shook its dust from his feet, and at the end of March betook himself on horseback to Mineral Point. His coming was a sensation throughout the mining region. But he soon repaired by steamer to St. Louis, and thence to Cincinnati, and 150 miles inland to a Dominican fraternity established at Somerset. This journey was for confession and consultation. Returning, he landed in Dubuque on July 4, 1835, and there, on the fifteenth of the next month, laid the corner-stone of a church (70 x 41 ft) of which he was himself the architect, in a town not two years old. September 12, he performed a similar function in Galena. These works he superintended obtained a church site in Prairie du Chien, and in April, 1836, repaired to St. Louis for his semi-annual confession. The previous autumn, as he was coming up from St. Louis, the steamer was stopped by ice, and he had three days of hard travel to arrive in Galena. October 25, 1836, when the first Territorial legislature of Wisconsin began its first session in Belmont, on motion of Patrick Quigly it was voted that “the chair invite the Rev. Mr. Mazzuchelli to open the meeting with prayer to-morrow.” This Quigly was the first man in Dubuque who had entertained the priest and provided him a room for his holy offices. The missionary describes himself in his book, as “elected by the diplomatic assembly to make a discourse to the chambers before their governor read to them his message,” seeming to mean by “discourse” something different from the daily prayer with which he says that he opened the sessions for a week (p. 188). The deep snow of the following winter did not prevent his laying 210 miles behind him for visiting Green Bay, and obtaining certain ritualistic ornaments which were needed in his new churchesm In April, 1837, he laid the first stone of a church in Davenport, for which he predicted a “boom.” although its inhabitants then numbered only a hundred. His next year was spent among lead miners, aside from penitential visits to St Louis. Aside from one month in 1838, and another in 1839, illness never stopped his progress. In 1840 he built a church in Iowa City, and another in Burlington. For sessions in the latter, the senate of Iowa paid so good a rent as to extinguish its debt. For the next three years, our missionary never itinerated far from the banks of the Mississippi. In 1842, he had finished a church on the Wisconsin mound of Sinsinawa, 300 feet above the plains, and there he founded Saint Clara Academy, in charge of Dominican Sisters. In February of that year, he visited Jo. Smith [Mormon “prophet” Joseph Smith], in Nauvoo Ill., and in 1843 he returned to Italy. His departure from Galena was on the 16th of April. He accompanied the bishop of St Louis to Baltimore, and attended the sessions of the council there. Embarking at New York in the “Great Western,” on May 25, within fourteen days he stepped ashore in Liverpool, and three weeks afterwards entered his native Milan. The following documents, selected from the archives of this Society, tell the interesting story of the early struggles of the Catholic parish of Green Bay, chiefly towards the erection and equipment of a local church building, and sustaining the mission at Little Chute. They are supplementary to, and illustrative of, Dr Butler’s sketch of Father Mazzuchelli, which should be read in connection therewith. To each paper is appended its press-mark, for the purpose of identification, eg, [G.L.P., XVLTI: 63]=Grignon, Lawe, and Porlier Papers, Vol. XVIII, No. 63. Monsieur Fenwick, Bishop of Cincinnati, having made me pastor of the parish of Mackinac Green bay and the surrounding country, I had proposed to myself to come to you before winter; but the circumstances in which I find myself do not permit me to do so. Desiring nevertheless to make known my arrival to the Catholics of Green bay, you will have the kindness to tell them that I am at Mackinac, and that I will come to see them in spring at the first opportunity, to remain there several weeks. The vicar M. Rese has urged me to do my utmost to have a Church at Green bay, and to write you in regard to this, in case I should not be able to go there. I beg you therefore, for the love of your religion, to put yourself at the head of so good a work, and to endeavor to procure the subscription which Mr Fauvel has taken, or to begin a new one, as you deem best. 1 Jacques Porlier, the chief justice of Brown county court, and a leading fur trader. Ed. to have it. The owner of the plat of the village of Navarino has sent me word that he is disposed to give 160 by 120 feet of land, for the erection of the Catholic Church. I know that it is the wish of the Bishop to have the Church in the village, rather than elsewhere. I advise you therefore not to commence the Church, nor to sell the old house, before receiving the reply of the Bishop. I will write to him to-day, and will shortly receive his answer. Do whatever is in your power to increase the subscription, and to have the timber prepared for a Church 60 feet long and 35 feet wide. I will not fail to take you the money for the Church, when I have the pleasure of seeing you again. Pray for me. 1. To collect all the pew rents that have not yet been paid. 2. To give 50 dollars to Mr Law. 3. To pay 44 dollars to Mr Smith if it shall be possible, with the money remaining in the hands of Mr. Louis Grignon, the money of the ladies’ society, and of that of St. John. 4. To make collections every day this summer; when there are 20 dollars, give them to Mr Charles Tibeau who has already had 34 dollars for his work. 5. To make 4 pews on the left of the Church, and pay for them with the rent of the same which should be at 4 dollars for the front two, and 3.50 for the two behind. 6. If it is possible, to have the Sacristy finished. 7. To hurry along the doors of the pews, until they have them completed. 8. To put a painted canvas [toile peniturdee] over the arch of the bell tower. 9. To thoroughly paint and putty all the outside of the tower, with two good coats to the spire. 10. To place 4 conductors or water troughs at the four corners of the Church. 11. To paint the four sides of the Church. 12. To treat yourselves to a stove to warm the Church. 14. During Lent, to make a small collection to pay the rent on the house for the priests,–that is to say, of 68 dollars. 15. To exact the payment of all which has been promised to the Church, in money, in wood, or in day’s work. 16. At Christmas or before, to take a collection for the Church.